"IDEALLY LOCATED - the restaurant Nol Bou can be found at the heart of the vibrant 15th arrondissement of Paris. You can eat traditional Korean cuisine here, in a spacious and very soberly decorated room. The wooden tables and comfortable red seat blend perfectly with the decor. It feels like an upscale restaurant in Asia. LOOSEN YOUR BELTS - cravings of culinary travel? Just push the doors of Nol Bou. Here, you will find grilled ravioli, fried squid, the famous bibimbap or the many typical homemade desserts, among others. BON APPÉTIT! - With family or friends, for lovers or curious people, indulge yourself with these various flavors that blend perfectly in the mouth." We absolutely loved the food and had a great time at the restaurant! 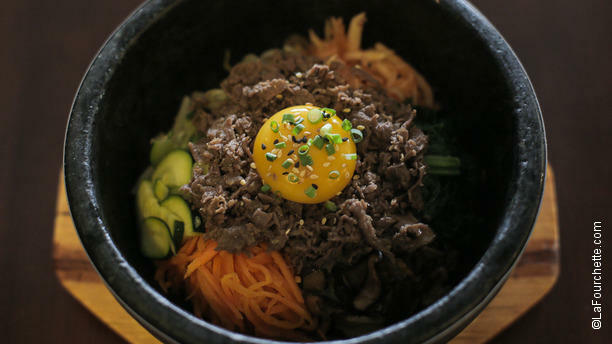 I definitely recommend it for those looking for Korean cuisine in Paris! A little bit disappointing. Too expensive for what it is, although the food is quite good. Très bon resto. A recommander. Great food! Great prices! Everything was well made, exceptionally fresh. Highly recommended! This is a fantastic korean restaurant, the family who run it are incredibly welcoming and the food is the best korean food we've had in Europe. The largest BIBIMBAP collection I've ever seen in a restaurant! Perfect service and really tasty food. Definitely returning for more BIBIMBAP action! great meal, good sized potions and friendly service. We quite regularly eat Korean food in other cites but this was the first time in Paris. The food was excellent, we were given an additional round of kimchi without asking and the service was quick and pleasant. Fantastic family run restaurant. Finally, a great restaurant just like in korea! Great typical food, friendly waiters... A great place. This was not a Korean barbecue, therefore their choices of condiments were limited. The food is decent and had nice flavor and the staff was friendly. We were a bit disappointed in comparison to the star rating. Check this out - the BBQ cooked at the table to a great meal! Handsome environnement, clean bathrooms, fairly pricey menu, dishes not as plentiful as expected, but very rich in flavor. Service kind and welcoming. Recommended for impressing a date!